Born 6 Jan 1794. Came to Utah in 1848, Andrew Cunningham Company. A poster states that a James Rawlins is wanted. Unknown if it is James Mason Rawlins. Documents from scans of James Rawlins. Typed from a handwritten transcription of the original provided to Julia Rawlins by Bert Rawlins. The copy was annotated "From Joyce." -- S. L. Rawlins, August 1997.) We will include a copy of the original in the book. Handwritten copy of James Rawlins testament of military service. This copy lists some of the children of James Rawlins. 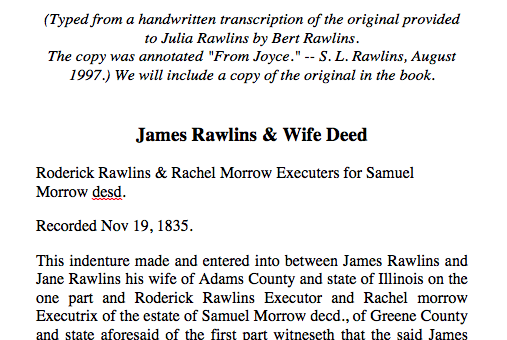 James Rawlins sealing to spouses temple records. This is a copy of James Rawlins record of ordination as a 70. Scanned image of James Rawlins and Jane Sharp's Nauvoo temple endowment register. Note: I had to compile this draft while I was unexpectedly away from home, with only the limited resources available on my laptop computer. Please send your additions and corrections to me via email at nehpets32@yahoo.com. My mailing address is 2638 Eastwood Ave, Richland, WA 99352. By using the web site we can all contribute to this document, making it more complete than any of us could do by ourselves -- Stephen Rawlins. The IGI World Misc. shows Jane Sharp Sealed to James Rawlins 16 May 1856 in the Endowment House, the same day that he was sealed to Harriet Wheat (http://test.familysearch.org/Eng/Search/frameset_search.asp) Film no. 183395, Ref no. 106. James Rawlins was a farmer. He lived at one time in Adams Co., Illinois. Ill. Son Harvey M . said in the 1880 census that both of his parents were born in Indiana - this was probably not true. SOURCE: Harvey M. Rawlins family records in possession Owen W. Rawlins Box 54 Lewiston, Ut . 84320; EH archives; Salt Lake City Cemetery Assoc. 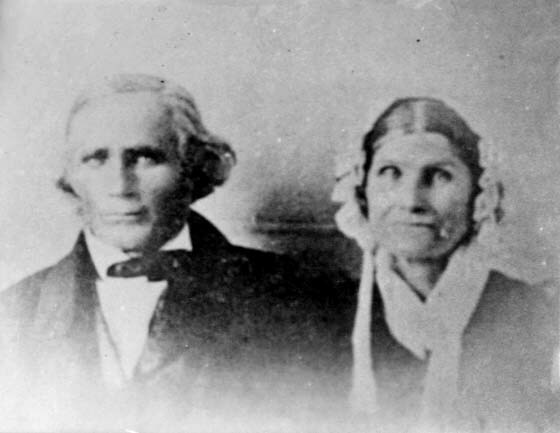 ; Nauvoo Sup; Early Millcreek Ward Records; fiche 6053258 (picture) p. 174: James Rawlins born in 1794; came to Utah in 1848 with And rew Cunning ham Co.; High Priest; Farmer. WILL: Will of James Rawlins written 4 March 1872; probated 20 Feb 1875 in Salt Lake County , Utah. BURIAL: James Rawlins buried 10 16 1874; Salt Lake City Cemetery, plot F; Bloc k 3;Lot 8, tier W; gra ve 4 (8th ave.) found no record of Jane. 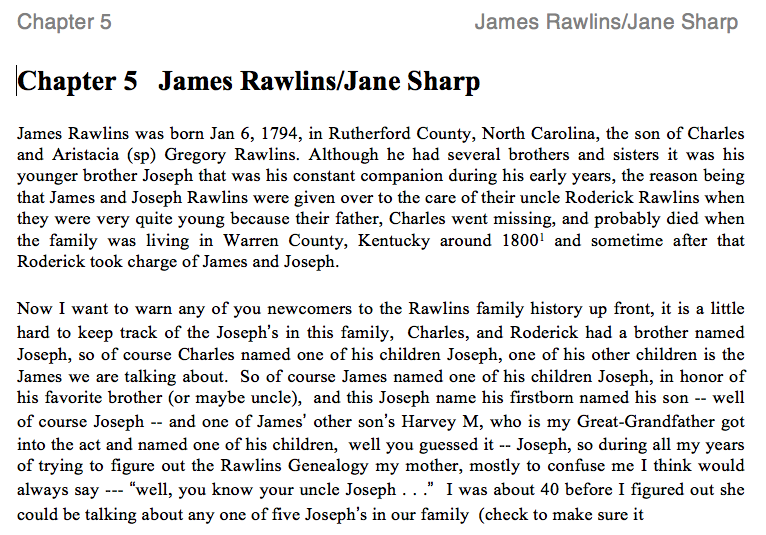 BIRTH: James Rawlins, son of Charles, gave his own birthdate as 6 Jan 1794 in Rutherford Co. , NC. Record of Rawlins given to Mary Evelyn Rawlins (SLR Comp. File) shows death date as 13 Oct 1874. The Life Sketch of James Rawlins by Ina Danielson states that James and Jane moved to Cache Valley in 1872, and James Rawlins died 12 May 1874 at Lewiston, Utah, buried in Richmond , Utah. There is no other evidence of these facts. War of 1812; Capt. Biggin's Co. of US Mounted Rangers; Private, Captain Alexander's Co. TN Militia 2M 5-10; 2M 15-20; 1M 30-40; 1F 5-; 1F 5-10; 2F 10-15; 1F 30-40; 1F 50-60 #95; Rawlings precinct; 1M 5; 1M 50; 2F 5; 3F 10; 2F 15; 1F 30 p. 126; b. KY; age 57 age 67; p. 238; b. KY age 76; #87; p. 503 age 78; b. 1793; enlisted 10 dec 1812; dis. 22 Apr 1813; md. Jane Sharp Apr 1817 in Harrison Co., IN; lives iin Mill Creek Precinct James Rawlins was a farmer. He lived at one time in Adams Co., Illinois. Son Harvey M. said in the 1880 census that both of his parents were born in Indiana - this was probably not true. 1850 census Great Salt Lake, Utah territory, film 015,540, pg. 80 Families of James Rollins and Jane, Joseph Sharp Rollins and Mary and Harvey M Rollins. James reports born in Ky, however, his father Charles was in 1790 in Rutherford county, N. Car. with his mother and children. Warren county, Ky. court abstracts976.974R28g, show Charles there as early as 1798 in land matters with his uncle Roderick. Card file Nauvoo baptisms for the dead in Miss. River James did his parents and aunts and uncles dec'd at that time. He was in Nauvoo and lived near prophet Joseph Smith's home, descendant, Bruce's father, Aerial Alfonzo, stated that Joseph Smith's children and children of James played together before the families were forced to leave Nauvoo in 1846/7. [S278] Book A32 slg, page 18. [S193] Ward Records, Early Mill Creek Ward Records;. [S189] Salt Lake City, Utah Cemetery records, 1847-1976, Salt Lake City Cemetery. Sexton (Main Author), (Salt Lake City : Utah State Archives, 1976), See Actual Text., Salt Lake City Cemetery Records;. [S95] Nauvoo L.D.S Records, Nauvoo Supp. [S216] Census Records, of Fremont County, Iowa 1850~~Utah 1850 Federal Census. [S388] Marriage Records, Harrison County, Indiana Marriage Records..
[S28] International Genealogical Index (R), The Church of Jesus Christ of Latter-day Saints, (Copyright (c) 1980, 1997, data as of February 1997), Ref. 8689802-2 shows "Cleared" for baptism, endowment and Seal-P dates. This also lists bi. [S40] Family Records: Rawlins, Lyle, Lyle Rawlins. [S62] Minnie Marget's File, Name:Rawlins, James~~bn:6-Jan-1794~~W. Rutherford Co., N. Car.~~WardMill. [S79] Excerpt from Perry Fitgerald, May 1998 -- scanned and placed on rawlins.org web site, August , 1998., Maud B. Allen, (January 1962), James Rawlins b 6 Jan. 1795 Danville Ky. d 17 Oct. 1874 md Jane Sharp. [S393] Jane and James Rawlins History by Eulalie Taggart, Eulaie Leavitt Taggart, James Rawlins was born 6 January 1794, in North Corlina, He died 17 October 1874 in Big Cot. [S28] International Genealogical Index (R), The Church of Jesus Christ of Latter-day Saints, (Copyright (c) 1980, 1997, data as of February 1997), LDS Church Ordinance~~Film No. 1033997~~Page no. 57~~Ord. no. 8. [S52] Utah Burials Database, Utah State Historical Society, (Internet web site), http://utstcess.dced.state.ut.us/NEWBURIALS/Silver., http://utstcess.dced.state.ut.us/NEWBURIALS/SilverStream/Pages/pgLongOne.html?CEMETERY_ID=SL2, 105&BURIAL_ID=6543, Rawlins, James, Birth:0/0/0, UNKNOWN, Death: 10/16/1874 , SALT LAKE CITY, UTAH, Buried: 10/16/1874, Grave Location: Salt Lake City Cemetery F-3-8-4-W.
[S394] Minnie Margets File, Information on a note to Julia stated:~~Buried 10-16-1874~~Salt Lake City Cemetery~~Plot F~. [S466] Early American Marriages: Atlantic South Region. [S515] Harvey M. Rawlins History by Eulalie Taggart, Eulalie Taggart, James Rawlins had two other wives after he came to Utah, but they never had any family by h.
[S28] International Genealogical Index (R), The Church of Jesus Christ of Latter-day Saints, (Copyright (c) 1980, 1997, data as of February 1997), Form submitted for proxy LDS temple ordinances. (Sealed to Sp. 17 Mar 1989, Provo)~~Batch n.